This Application developed, managed and provided by Callup Net LTD (“the Company” and/or “Callup” and or “Licensor”). All rights reserve to Callup. Using this Application is subject to this End User Licensed Agreement (“EULA”) and Terms and Conditions (“T&C”) (together hereinafter refer as “the Agreement”). THIS APPLICATION PROVIDED YOU FOR THE ONLY PURPOSE AS DEFINE BY THE COMPANY OR ANY THIRD PARTY ON ITS BEHALF. THIS AGREEMENT CONSTITUTES A BINDING CONTRACT ON YOU AND GOVERNS YOUR USE OF AND ACCESS TO THE APPLICATION BY YOU OR THIRD PARTY ON YOUR BEHALF, AGENTS AND END-USERS WHETHER IN CONNECTION WITH A PAID OR FREE TRIAL USAGE OF THE APPLICATION. By accepting this Agreement, either by accessing or using the Application, or authorizing or permitting any Agent, End-User or any other person on your behalf to access or use the Application, You agree to be bound by this Agreement. If You are entering into this Agreement on behalf of a company, organization or another legal entity (an “Entity”), You are agreeing to this Agreement for that Entity and representing to Callup that You have the authority to bind such Entity and its Affiliates to this Agreement, in which case the terms “End User” “You,” “Your” or a related capitalized term herein shall refer to such Entity and its Affiliates. If You do not have such authority, or if You do not agree with this Agreement, You must not accept this Agreement and may not use any of the Application. 1.1. The Application is provided to you as part of your Voicemail services as made available to you by your Mobile Service Provider (MSP). IF FROM SOME REASON, YOU ARE NOT ABLE TO USE THE APPLICATION, CONTACT YOUR MOBILE SERVICE PROVIDER ONLY. 1.2. Using the Application, you will be able to download, save and store your Voicemail recordings (“Transferred Data”)on your personal end-point mobile device. This service is subject to available memory on your end-point mobile device. 1.3. The Application shell only be installing on an end-point mobile device that you own (i.e. Cellphones, Tablets etc.) and uses your MSP’s SIM card. 1.4. An Internet connection is required for proper use of the Application. You are responsible for procuring and maintaining the network connections that connect Your network to the Application, including, but not limited to, “browser” software that supports protocols used by the Company, including the Transport Layer Security (TLS) protocol or other protocols accepted by the Company, and to follow procedures for accessing services that support such protocols. We are not responsible for notifying You or other person on your behalf, Agents or End-Users of any upgrades, fixes or enhancements to any such software or for any compromise of data, including the transferred Data, transmitted across computer networks or telecommunications facilities (including but not limited to the Internet) which are not owned, operated or controlled by The Company. We assume no responsibility for the reliability or performance of any connections as described in this section. 1.5. You acknowledge that the Company may modify the features and functionality of the Application during the term of use. 1.6. The Application perform an automatic authentication process – no need of subscription. 1.7. In order to use the Application, you shell grant the Application root permission, access and use permissions to your internal and external device’s storage, location services and/or any other permissions enable the Application to function properly and / or to be operated by the Company. These permissions are mandatory for using the Application and revoking permissions will impair the ability of the Application to function properly or at all. 1.8. Consent to Use of Data: You agree that the Company may collect and use technical data and related information—including but not limited to technical information about your device, system and application software, and peripherals—that is gathered periodically to facilitate the provision of software updates, product support, and other services to you (if any) related to the Licensed Application. The Company may use this information, as long as it is in a form that does not personally identify you, to improve its products or to provide services or technologies to you. 1.9. In addition to complying with the other terms, conditions and restrictions set forth below in this Agreement, You agree not to (a) license, sublicense, sell, resell, rent, lease, transfer, assign, distribute, time share or otherwise commercially exploit or make the Application available to any third party, other than authorized third party on your behalf, in furtherance of Your personal usage purposes as expressly permitted by this Agreement; (b) use the Application to Process data on behalf of any third party other than authorized third party on your behalf; (c) modify, adapt, or hack the Application or otherwise attempt to gain unauthorized access to the Application or related systems or networks; (d) falsely imply any sponsorship or association with the Company or any of its affiliate (e) use the Application in any unlawful manner, including, but not limited to, violation of any person’s privacy rights; (f) use the Application to send unsolicited or unauthorized bulk mail, junk mail, spam, pyramid schemes or other forms of duplicative or unsolicited messages; (g) use the Application to store or transmit files, materials, data, text, audio, video, images or other content that infringes on any person’s intellectual property rights or privacy; (h) use the Application in any manner that interferes with or disrupts the integrity or performance of the Application and its components; (i) attempt to decipher, decompile, reverse engineer or otherwise discover the source code of any software making up the Application; (j) use the Application to knowingly post, transmit, upload, link to, send or store any content that is unlawful, racist, hateful, abusive, libelous, obscene, or discriminatory; (k) use the Application to store or transmit any “protected health information” as that term is defined in 45 C.F.R. 160.103, unless expressly agreed to otherwise in writing by the Company; (l) use the Application to knowingly post transmit, upload, link to, send or store any viruses, malware, Trojan horses, time bombs, or any other similar harmful software (“Malicious Software”); (m) use or launch any automated system that accesses a Service (i.e., bot) in a manner that sends more request messages to a Service server in a given period of time than a human can reasonably produce in the same period by using a conventional on-line web browser; or (n) attempt to use, or use the Application in violation of this Agreement. 1.10. We will (a) make the Application available to You pursuant to this Agreement; (b) use commercially reasonable efforts to make the Services available 24 hours a day, 7 days a week, except (1) during planned downtime for upgrades and maintenance to the Application (of which We will use commercially reasonable efforts to notify You in advance through our website and/or specific notice to You (“Planned Downtime”); and (2) for any unavailability caused by circumstances beyond our reasonable control, including, for example, an act of God, act of government, flood, fire, earthquake, civil unrest, act of terror, strike or other labor problem (other than one involving Our employees), Internet service provider failure or delay, Third Party Services, or acts undertaken by third parties, including without limitation, denial of service attack (“Force Majeure Event”). 1.11. You are responsible for compliance with the provisions of this Agreement by the use of any other person on your behalf or any other Agents and End-Users and for any and all activities that occur under Your Device. Without limiting the foregoing, You are solely responsible for ensuring that use of the Application to store and transmit Data is compliant with all applicable laws and regulations as well as any and all privacy policies, agreements or other obligations You may maintain or enter into with any other third party, Agents or End-Users. You also maintain all responsibility for determining whether the Application or the information generated thereby is accurate or sufficient for Your purposes. 1.12. In addition to Our rights as set forth in this agreement, We reserve the right, in Our reasonable discretion, to temporarily suspend Your access to and use of the Application if We suspect or detect any Malicious Software connected to Your device or use of the Application. 1.13. You may not access or use the Application if You are a direct competitor of the Company, except with the Company's prior written consent. You may not access the Application for the purposes of monitoring performance, availability, functionality, or for any benchmarking or competitive purposes. 2.1. This Application made available to you is licensed, not sold, to you. The Company grants to you a nontransferable license to use the Licensed Application on any mobile devise that you own or control and as permitted by this Agreement. 2.2. The terms of this Agreement will govern any content, materials, or services accessible from or purchased within the Licensed Application as well as upgrades provided by the Company that replace or supplement the original Licensed Application, unless such upgrade is accompanied by a Custom Agreement. 2.3. You may not distribute or make the Licensed Application available over a network without a written permission of the Company. You may not transfer, redistribute or sublicense the Licensed Application. You may not copy, reverse-engineer, disassemble, attempt to derive the source code of, modify, or create derivative works of the Licensed Application, any updates, or any part thereof (except as and only to the extent that any foregoing restriction is prohibited by applicable law or to the extent as may be permitted by the licensing terms governing use of any open-sourced components included with the Licensed Application). 3.1. The Company shall retain all rights, title and interest in and to all its respective patents, inventions, copyrights, trademarks, domain names, trade secrets, know-how and any other intellectual property and/or proprietary rights (collectively, “Intellectual Property Rights”). 3.2. The rights granted to You, Agents and End-Users to use the Application under this Agreement do not convey any additional rights in the Application or in any Intellectual Property Rights associated therewith. 3.3. Subject only to limited rights to access and use the Application as expressly stated herein, all rights, title and interest in and to the Application and all hardware, Software and other components of or used to provide the Application, including all related Intellectual Property Rights, will remain with The Company and belong exclusively to The Company. The Company shall have a fully paid-up, royalty-free, worldwide, transferable, sub-licensable (through multiple layers), assignable, irrevocable and perpetual license to implement, use, modify, commercially exploit, and/or incorporate into the Application or otherwise use any suggestions, enhancement requests, recommendations or other feedback We receive from You, Agents, End-Users, or other third parties acting on Your behalf.The Company, and the Company’s other product and service names and logos used or displayed in or on the Application are registered or unregistered trademarks of the Company (collectively, “Marks”), and You may only use applicable Marks in a reasonable manner to identify You as a User; provided You do not attempt, now or in the future, to claim any rights in the Marks, degrade the distinctiveness of the Marks, or use the Marks to disparage or misrepresent Us, Our services or products. 4.1. You confirm and represent that the Application be used for Your benefit only; The Company shall not be responsible for any unauthorized activity relating to a use of or access to the Application. 4.2. You must protect any access to your end-point mobile device with a password and keep your password personal and secure. You must notify the Company and/or your MSP immediately when your end point mobile device has been stolen or lost and of any suspected breach of security or unauthorized use of Your end-point mobile device. The Company will not be liable for any losses caused to You or any third party by any unauthorized use of Your end-point mobile device. You will be liable for any loss caused to the Company or any third party due to such unauthorized use. 4.3. The Company will maintain reasonable administrative, physical, and technical safeguards for protection of the security, confidentiality and integrity of the Transferred Data by and through the Application. Those safeguards will include, but will not be limited to, measures for preventing access, use, modification or disclosure of the transfer Data by Personnel except (a) to provide the Application and prevent or address service, support or technical problems; (b) as compelled by law. 4.4. 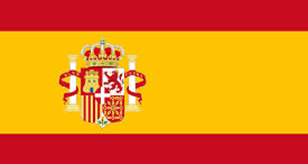 To the extent the Transferred Data constitutes Personal Data as define by the General Data Protection Regulation (GDPR) (EU) 2016/679 or other likewise Privacy protection law, You shall be deemed to be the data controller or Data Owner as these term is understood under the Applicable Data Protection Law. 4.5. The Application transfer data directly to the End-User’s device using Peer to Peer technology. It did not store any data. Therefore, under no circumstances will the Company be deemed a data controller or processor with respect to use of the Application under Applicable Data Protection Law or any relevant law or regulation of any Member State as defined in Applicable Data Protection Law. 4.6. The Company may have access to Transferred Data as part of performing its services to you. The Company shall implement and maintain administrative, technical, physical and organizational information security measures, based on the ISO certification mechanism method of ISO 27001:2013. The Company is ISO 27001 certified. 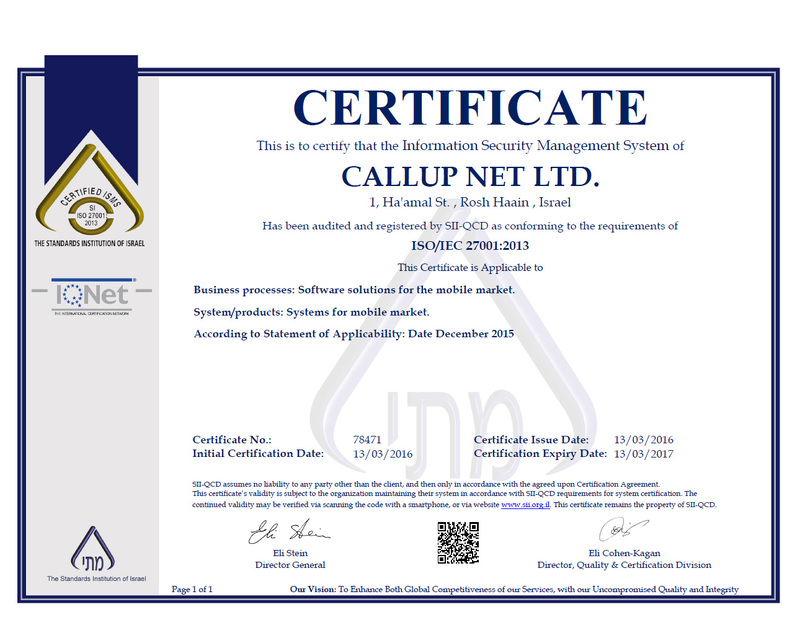 The ISO certificates are available at http://www.callup.net/images/callup/ISO27001.jpg. 4.7. You obligate to cooperate with the Company on any Privacy or Security issue derived from the use of or access to the Application. Including, as reasonably requires, implement privacy or security measures as may be needed to maintain the Company privacy and security level. 4.8. You agree that the Company and the third-party service providers that are utilized by the Company to assist in providing the Services to You shall have the right to access Your Application or Transferred Data and to use, modify, reproduce, distribute, display and disclose data to the extent necessary to provide the Application, including, without limitation, in response to Your support requests. Any third-party service providers utilized by the Company will only be given access to Your Application or Transferred Data as is reasonably necessary to provide the Application and will be subject to (a) confidentiality obligations which are commercially reasonable and substantially consistent with the standards of security and privacy protection as described above. 5.1. If You decide to enable, access or use Third Party Services, be advised that Your access and use of such Third Party Services are governed solely by the terms and conditions of such Third Party Services, and We do not endorse, are not responsible or liable for, and make no representations as to any aspect of such Third Party Services, including, without limitation, their content or the manner in which they handle, protect, manage or Process data or any interaction between You and the provider of such Third Party Services. 5.2. We cannot guarantee the continued availability of such Third Party Service features, and may cease enabling access to them without entitling You to any refund, credit, or Third Party compensation, if, for example and without limitation, the provider of an Third Party Service ceases to make the Third Party Service available for interoperation with the corresponding Service in a manner acceptable to Us. You irrevocably waive any claim against The Company with respect to such Third Party Services. We are not liable for any damage or loss caused or alleged to be caused by or in connection with Your enablement, access or use of any such Third Party Services, or Your reliance on the privacy practices, data security processes or other policies of such Third Party Services. 6.1. You may choose to terminate the use of or access to the Application by uninstall the application from your end-point device. 6.2. When your MSP decided to terminate your voice mail services, you will no longer be able to use the Application and we will terminate its service. 6.3. We may elect to terminate the use of or access to the Application in any case that the relationships between us and your MSP are terminated or in any other reason that preventing from us to provide the services given by the Application. 6.4. We reserve the right to modify, suspend or terminate the use of or access to the Application or Your and/or Agents’ or End-Users’ rights to access and use the Application, if We believe that You, Agents or End-Users have violated this Agreement. We shall not be liable to You, Agents, End-Users or any other third party for any such modification, suspension or discontinuation of Your rights to access and use the Application. Any suspected fraudulent, abusive, or illegal activity by You, Agents or End-Users may be referred to law enforcement authorities at Our sole discretion. THE APPLICATION, INCLUDING ALL SERVER AND NETWORK COMPONENTS ARE PROVIDED ON AN “AS IS” AND “AS AVAILABLE” BASIS, WITHOUT ANY WARRANTIES OF ANY KIND TO THE FULLEST EXTENT PERMITTED BY LAW, AND WE EXPRESSLY DISCLAIM ANY AND ALL WARRANTIES, WHETHER EXPRESS OR IMPLIED, INCLUDING, BUT NOT LIMITED TO, ANY IMPLIED WARRANTIES OF MERCHANTABILITY, TITLE, FITNESS FOR A PARTICULAR PURPOSE, AND NON-INFRINGEMENT. YOU ACKNOWLEDGE THAT WE DO NOT WARRANT THAT THE SERVICES WILL BE UNINTERRUPTED, TIMELY, SECURE, ERROR-FREE OR FREE FROM VIRUSES OR OTHER MALICIOUS SOFTWARE, AND NO INFORMATION OR ADVICE OBTAINED BY YOU FROM US OR THROUGH THE SERVICES SHALL CREATE ANY WARRANTY NOT EXPRESSLY STATED IN THIS AGREEMENT. 8.1. UNDER NO CIRCUMSTANCES AND UNDER NO LEGAL THEORY (WHETHER IN CONTRACT, TORT, NEGLIGENCE OR OTHERWISE) WILL THE COMPANY, OR ITS AFFILIATES, OFFICERS, DIRECTORS, EMPLOYEES, AGENTS, SERVICE PROVIDERS, SUPPLIERS OR LICENSORS BE LIABLE TO YOU OR ANY THIRD PARTY FOR ANY LOST PROFITS, LOST SALES OR BUSINESS, LOST DATA, (BEING DATA LOST IN THE COURSE OF TRANSMISSION VIA YOUR SYSTEMS OR OVER THE INTERNET THROUGH NO FAULT OF THE COMPANY), BUSINESS INTERRUPTION, LOSS OF GOODWILL, OR FOR ANY TYPE OF INDIRECT, INCIDENTAL, SPECIAL, EXEMPLARY, CONSEQUENTIAL OR PUNITIVE LOSS OR DAMAGES, OR ANY OTHER LOSS OR DAMAGES INCURRED BY THE USE OR ACCESS TO THE APPLICATION, REGARDLESS OF WHETHER THE COMPANY HAS BEEN ADVISED OF THE POSSIBILITY OF OR COULD HAVE FORESEEN SUCH DAMAGES. 8.2. NOTWITHSTANDING ANYTHING TO THE CONTRARY IN THIS AGREEMENT, THE COMPANY’S AGGREGATE LIABILITY TO YOU OR ANY THIRD PARTY ARISING OUT OF THIS AGREEMENT OR THE USE OR ACCESS TO THE APPLICATION, SHALL IN NO EVENT EXCEED THE VOICE MAIL SERVICES CHARGES PAID BY YOU TO THE MSP DURING THE TWELVE (12) MONTHS PRIOR TO THE FIRST EVENT OR OCCURRENCE GIVING RISE TO SUCH LIABILITY. YOU ACKNOWLEDGE AND AGREE THAT THE ESSENTIAL PURPOSE OF THIS SECTION IS TO ALLOCATE THE RISKS UNDER THIS AGREEMENT BETWEEN THE PARTIES AND LIMIT POTENTIAL LIABILITY GIVEN THE SUBSCRIPTION CHARGES AND CONSULTING FEES, WHICH WOULD HAVE BEEN SUBSTANTIALLY HIGHER IF WE WERE TO ASSUME ANY FURTHER LIABILITY OTHER THAN AS SET FORTH HEREIN. WE HAVE RELIED ON THESE LIMITATIONS IN DETERMINING WHETHER TO PROVIDE YOU WITH THE RIGHTS TO ACCESS AND USE THE APPLICATION PROVIDED FOR IN THIS AGREEMENT. 8.3. Some jurisdictions do not allow the exclusion of implied warranties or limitation of liability for incidental or consequential damages, which means that some of the above limitations may not apply to You. IN THESE JURISDICTIONS, THE COMPANY’S LIABILITY WILL BE LIMITED TO THE GREATEST EXTENT PERMITTED BY LAW. 8.4. Any claims or damages that You may have against the Company shall only be enforceable against the Company and not any other entity or its officers, directors, representatives or agents. You will indemnify and hold the Company harmless against any claim brought by a third party against us arising from or related to use of or access to the Application by You, Agents or End-Users in breach of this Agreement or matters for which You have expressly agreed to be responsible pursuant to this Agreement; provided (a) We shall promptly notify You of the threat or notice of such claim; (b) You will have the sole and exclusive control and authority to select defense attorneys, and defend and/or settle any such claim (however, You shall not settle or compromise any claim that results in liability or admission of any liability by Us without Our prior written consent); and (c) We fully cooperate with You in connection therewith. 10. ASSIGNMENT, ENTIRE AGREEMENT, AMENDMENT, SEVERABILITY, NOTICES AND GOVERNING LAWS. 10.1. 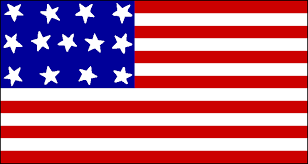 You may not, directly or indirectly, by operation of law or otherwise, assign all or any part of this Agreement or Your rights under this Agreement or delegate performance of Your duties under this Agreement without Our prior consent, which consent will not be unreasonably withheld. We may, without Your consent, assign this Agreement to any third party or in connection with any merger or change of control of the Company or the sale of all or substantially all of Our assets provided that any such successor agrees to fulfill its obligations pursuant to this Agreement. Subject to the foregoing restrictions, this Agreement will be fully binding upon, inure to the benefit of and be enforceable by the Parties and their respective successors and assigns. 10.2. This Agreement constitutes the entire agreement, and supersede any and all prior agreements between You and the Company with regard to the subject matter hereof. This Agreement shall apply in lieu of the terms or conditions in any purchase order or other order documentation You or any Entity which You represent provides (all such terms or conditions being null and void), and, except as expressly stated herein, there are no other agreements, representations, warranties, or commitments which may be relied upon by either Party with respect to the subject matter hereof. There are no oral promises, conditions, representations, understandings, interpretations, or terms of any kind between the Parties, except as may otherwise be expressly provided herein. 10.3. We reserve the right to amend the terms of this Agreement from time to time, in which case the new Agreement will supersede prior versions. Therefore, you must look at the terms of the Agreement regularly to check for such changes. The modified version of the Agreement (the "Modified Agreement") will be made available within the Application (for any modified additional terms). If you do not agree the Modified Agreement you must stop using the Application. Your continued use of the Application after the date the Modifies Agreement is posted will constitute your acceptance of the Modifies Agreement. Our failure to enforce at any time any provision of this Agreement does not constitute a waiver of that provision or of any other provision of this Agreement. 10.4. If any provision in this Agreement is held by a court of competent jurisdiction to be unenforceable, such provision shall be modified by the court and interpreted so as to best accomplish the original provision to the fullest extent permitted by law, and the remaining provisions of this Agreement shall remain in effect. 10.5. All notices to be provided by the Company to You under this Agreement may be delivered in writing by electronic mail to the electronic mail address as you provided to your MSP. You must give notice to the Company in writing by electronic email to: support.android@callup.net. 10.6. This Agreement shall be governed by the laws of the State of Israel, without reference to conflict of laws principles. Any disputes under this Agreement shall be resolved in a court of general jurisdiction in Tel-Aviv, Israel. You hereby expressly agree to submit to the exclusive personal jurisdiction of this jurisdiction for the purpose of resolving any dispute relating to this Agreement or access to or use of the Services by You, Agents or End Users.